Italy in sunny southen Europe, with a reputation for wine, pizza and exlusive GT cars, also knows how to produce motorcycles. This feeling for grace and guts, is very much apparent in the latest addition to the Swedish big 'bike market, the Benelli Tornado. The machine is built for the dollar market, and this particular model was also meant for the US, but was borrowed to test buyer appeal in Sweden. 'No decision has been made to import it as yet, but we still thought the 'bike of interest, and believe this test to be a European scoop. Benelli is, in fact, Italy's largest motor­cycle producer, even though the bulk of production is made up of mini-bikes. The firm has been in business since before World War One, and descendants of the original Benelli brothers are still in charge. Formerly small 'bikes dominated the Benelli programme, but to get a foot on the American continent one needs all sizes in the model range. And one also needs a prestige model. So Benelli decided to make a real heavy-weight, aimed at the traditional British Big 'Bike Buyer. The first prototype was very English in appear­ance, with an obviously Metisse inspired frame. Then they though better of it, realised Italy has enough good designers not to have to copy something, and came up with this 650 from scratch. The new Benelli strikes an Italian note; beautiful, clean lines. The deep blue and white finish contrasts with a black frame, and chrome in abundance. The cradle frame with two front tubes and a single under the tank follows modern con­vention. The rear shock absorbers are Ceriani while the front fork, which looks Ceriani, comes from another Italian firm. The fork legs are naked, with special rubber seals protecting the innards when the legs are moving. Brakes are one of the Benelli's strong points; the Grimecca units have hubs cast in aluminium. Benelli have always been active in racing, and many of the lessons learned have been incorporated in the front brake, which,has twin leading shoes - not just on one side but on both. The hub is 230 mm and houses two parrs of brake pads. These are manoeuvred by one cable from the brake lever to a junction box, from where two cables take the move­ment to each brake arm. The junction is identical to that on the racing Benelli As far as we know, this brake is unique for a mass-produced standard 'bike. We were happy to see that Benelli has spent so much money on this important safety factor. The sis rear brake is also a nice job, and it reflects the overall high quality of the machine. The diameter of the rear unit is 187 mm, and the 'bike weighs 182 kg. The engine is also very interesting. The crank case is split horizontally, through the crankshaft and gearbox bearings. We believe this to be Japanese practice, and it has been taken up by both Laverda and Benelli. The result is usually a very oiltight unit. Most characteristic feature of the engine is the extremely short stroke, 58 mm, as compared to a bore of 84 mm, measurements pointing to a high-revving engine. Maximum power, 58 bhp, is delivered at 7400 rpm, but there is a tuned version giving 60 at eight-two. These figures indicate a fairly high state of tune for a conventional ohv twin of 643 ccs. Maximum torque is 5.5 kpm, rather high up in the register at 4100 rpm. The big bore allows for big valves; the intake has a diameter of 38 mm, the exhaust 35. An overhead cam and 180° crank would have been no surprise, but Benelli didn't go that Japanese. The valves are operated by pushrods from the cam­shaft, which sits on four ballbearings in front of the cylinders, in the split plane. The crankshaft is also robust, resting on four roller- and ballbearings. The flywheel is located centrally, between the inner mains, which gives a short and robust shaft. The two pistons run parallel in light alloy cylinders with cast-in linings; both cylinders and heads are separate and each held on to the crankcase by four through-bolts. In other words, an easy-to-work-on engine. You needn't lift the whole top off if you only want to look at, say, the right hand piston. Engine and gearbox are lubricated with the same oil — there is no wall between engine and 'box. This is typical Italian practice, also found on Ducati. There are two different oil filters, a coarse, meshed one at the pump's suction pipe, and a finer car-type filter, which is reached through the bottom of the crankcase. The oil level is visibly checked through a glass inspec­tion "eye" on the right of the crankcase. On the right-hand side of the crankshaft, helical gears take up the drive to the clutch and camshaft. The clutch is a multiplate unit running in oil. The kick and gear-change pedals are also on this side. The generator has been designed with future electric starting in mind. Electrical equip­ment is mounted on the left side, where the two contact-breakers, with fly-weights, rotate with the camshaft. The Bosch DC generator above the gearbox is belt-driven, and other Bosch components are: ignition coils under the tank, voltage regulator and, two six volt batteries in series, giving twelve volts, and a capacity of 12 ah (amp hours). Carburetters are Dell'Orto Concentric, 29 mm, with square slides. They cannot be flooded but there is a choke, operated from a lever on the handlebar. We have already said that this motor­cycle is a fine piece of engineering, and the more you look at it, the more this is confirmed. Benelli's chief constructor, Piero Prompolini, has made sure that his men have not tried any short cuts in the detail specification. Many parts are rubber-mounted to take up vibration, and to protect the rider from annoying reson­ance sounds. Speedometer and tachometer are mounted on rubber, as are the silencers, held at two points in rubber. More rubber is employed at the headlamp, tank, handle­bar and the side covers over the batteries and air filter. Starting the Benelli was not always easy. You open the fuel taps, close the choke and start kicking. It usually takes some time before the mixture is rich enough to fire up the engine from cold and we counted three kicks as an average. The engine is quiet, though it takes on a racy note at high revs. The short stroke and light flywheel, we think, make the engine very willing to rev. When warm it is very responsive, and runs up the rev-band unusually fast. The Italian-made rev counter unfortunately lagged way behind - a quick twist of the grip and accompanying rise in the engine note registered only 3000 when we were definitely around 5000. The engine may not be very sensitive to over-revving, but to do it repeatedly in the lower gears might do some harm in time. A more accurate instrument is definitely wanted. The riding position is a good com­promise for high-speed work and town pottering, with a handlebar that is not extreme in any T.T. or Hell's Angels direction. Footrests are folding and the rubbers have reinforced foot pads, eliminating the customary tingle. They are not very durable, though, and after some use will probably wear down and look like ordinary rubbers. The seat is comfortable, hard rather than soft, good for a long run. It is easily removable by unfastening two screws, revealing the tool-kit. One immediately feels at home in the saddle, and it gives no impression of being a 182 kg heavyweight; it is much more like a nimble 350. It is easy to navigate through heavy traffic, and there is no problem in broadsliding round bends on gravel roads, at the other hand. A warning, though: accelerating out of corners on non-paved roads (a favourite pastime on secondary roads in Sweden! ), or going over hump­backs too fast, the engine revs soar and the rear wheel easily spins. (/'// remember that. Ed). The 'bike's natural environment is, of course, good roads and high speed touring, and at this the Benelli also excels, although at really high speeds the riding position offers a bit too much wind resistance. With a slight crouch, we had 6500 on the rev-counter (it can accept a slow rise of revolutions) and that corresponds to roughly 105 mph. 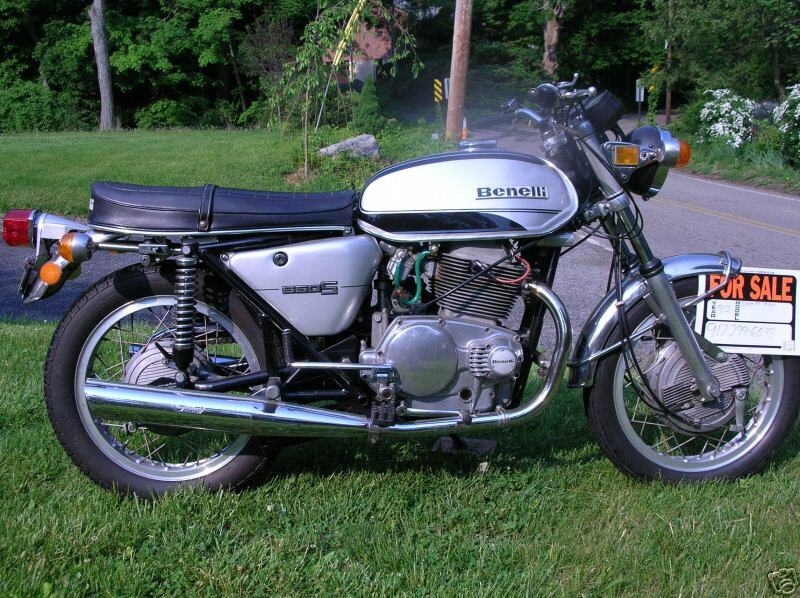 Under favourable cir­cumstances one may get another 500 revs, but the Benelli, as most 'bikes, is somewhat overgeared. You are not likely to reach maximum revs in high gear. We must commend the powerplant on its extreme smoothness — no vibration at any speed due, as we said, to the short stroke and low weight, rather than to the rubber. Five gears on such a powerful 'bike seems a waste, but the reason is that power comes in some way up the rev-band. There is nothing under 2000; at three it starts coming in, but the real fun begins at four. A standing quarter mile takes just over 14 seconds. To keep yourself and engine happy, the gearbox has to be used frequently. The mechanism works well but there is a notch between each gear which has to be passed. It means very little in practice, but when changing down (pedal up) we had to take care that the gear really is engaged. Clutch and gearbox gave no trouble whatsoever and required very little effort. Clutch and front brake cables are pro­tected by rubber covers at the lever ends, to the credit of the Benelli detail designers. Handling androadholdingare, of course, outstanding, which well they should be, considering the enormous amount of lire the firm has spent on the race tracks. The front fork has a friction-type- steering brake that can be setfpj different road conditions. Brake slackened for gravel and town work, taut for motorway travel, seemed the right settings. First to ground are the foot rests, but as they fold this was no problem. Silencers don't touch the tarmac, even though we had expected them to, as the exhaust pipes go a long way out from the engine. The side stand could be better situated. Putting your foot on the rest depresses the stand somewhat, so that it "scratches" when cornering on the limit. Nothing dramatic happens, though — it just presses back on the foot-rest. The suspension on our machine was rather firm, like the seat, but the season must take some blame for this. It was early November when we had the 'bike, and the low temperature raised the viscosity of the oil. Despite this, the suspension provided a good standard of comfort and functioned well. Every pot-hole was swallowed up in a progressive way, and we never bottomed front or rear. Braking was superb — th« front brake is terrifyingly effective, and had to be used with discrimination. It wil stand up to very hard use from high speed; and due to big brake area and good ventilation, heat generation is low, provid­ing an extremely fade-free device. The rear brake also impressed us. This if an often overlooked component or modern motorcycles On many 'bikes the sprocket is in unit with the brake drum, and the whole bolted to the hub. With this method heat dissipation is poor. BeneH and other leading 'bike builders do it this way: sprocket on one side (the left), and the brake drum shrunk into the aluminium hub, on the other. It is difficult to say anything about Benelli quality, as the marque is new to us. But if you look at details, you find'many nice touches and costly solutions to design problems. Look at the crank and cam­shafts, on four bearings, the needle bear­ings for the big and small ends. Look at the lavish use of rubber, even though we can think of a few twins that could use it more. Look ait the brakes. The Benelli will not be cheap, in any sense of the word, when it comes to Sweden - if it does. You will get what you pay for, though. We think we can say that much, after reluctantly returning this beauty to its would-be importer.